On April 18, 2017, F. S. Rowland Hall at UC Irvine, our first Chemistry building, was dedicated as a National Historic Chemical Landmark by the American Chemical Society. 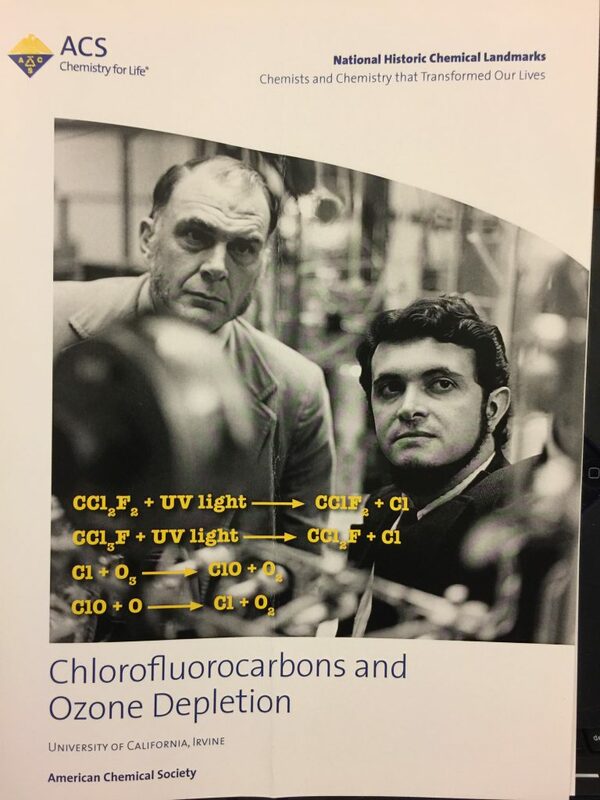 Here, in 1974, atmospheric chemists F. Sherwood Rowland and Mario Molina showed that ChloroFluoroCarbons (CFCs) used as a refrigerator coolant and as a propellant in hair sprays, were catalysts for the continuous breakup of ozone. The CFCs rose into the stratosphere and destroyed ozone, which is crucial in filtering out ultraviolet rays from the sun, and protecting life on earth. After a long and difficult fight of denial with the chemical companies, similar to the fossil fuel fights today, science won out. The Montreal Protocols were signed in 1987 to ban CFCs. In 1995, F. Sherwood Rowland and Mario Molina shared the Chemistry Nobel Prize with Paul J. Crutzen. Our first Physical Sciences I building housing Chemistry, Physics, and Mathematics was expanded, and named Rowland Hall. Sandra Thompson, Chair of the Orange County Section of the American Chemical Society. Unfortunately, Prof. Mario Molina, Distinguished Professor of Chemistry and Biochemistry at UC San Diego, could not make it. Chancellor Gilman praised Profs. Rowland and Molina, and noted that not only did they get the Nobel Prize, but they also got it for saving the earth. He also noted another first that while Rowland and Molina won the 1995 Chemistry Prize, Professor Frederick Reines of UC Irvine Physics and Astronomy also shared the 1995 Physics Nobel Prize. This entry was posted in Climate Science, F. Sherwood Rowland and Mario Molina, Rowland Hall, UC Irvine. Bookmark the permalink.